There are many ways to travel around Korea, but the most popular way to get from one region to another is by buses. Both express and intercity buses have extensive networks throughout the country, providing transportation from one city to another at reasonable prices. In addition to timely departures and arrivals, the buses are neatly maintained and have very accommodating atmospheres that offers an enjoyable ride for passengers. In most cases, both the express and intercity bus terminals are located closely at the center of each city. 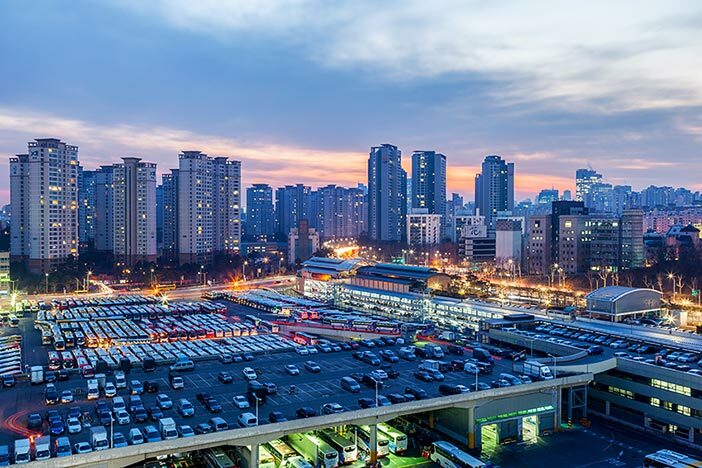 However, in some cities, such as Seoul, the terminals are found at different locations in the city. Visitors are advised to double check the boarding location of the bus before departure. Take note that if a bus terminal name includes the word jonghap, it means that the terminal provides both express and intercity bus transportation. Express buses run on expressways and may stop at a rest area but seldom make a stopover in a city other than its destination. Different fares apply for ilban (regular or standard) and udeung (luxury) buses. Udeung buses offer additional comfort with wider seats. Overnight buses are also available at a slightly higher rate. Intercity buses usually make stopovers at smaller cities while on its way from one region to another region. An intercity bus that runs directly from one region to its destination without any stopover is referred to as jikhaeng (direct route) or mujeongcha (non-stop). Ticket price for nighttime buses that run late at night usually cost more than daytime buses. This page was last updated on November 26, 2018, and therefore information may differ from what is presented here.